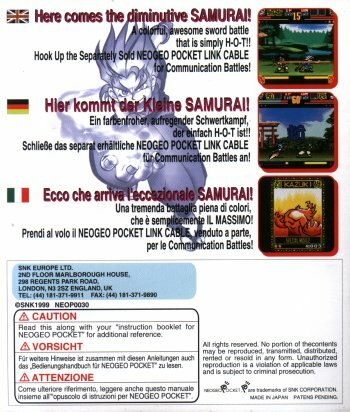 STORY: (SS2: Pocket follows the same storyline as Samurai Shodown 64: Warriors Rage). In an unknown land an eerie disturbance disrupts the sky, leading a dark mass to the land. It is the ultimate evil-it is the reincarnation of Yuga the Destroyer. The objective of this being who once more alights to earth is the unification of this world and the Netherworld using the hermaphrodite male and female-that is, the construction of a utopia to become the foundation for the resurrection of the Dark God. As he resumes his search for the hermaphrodites, those turned into puppets by Yuga's magic unleash their carnage to gather the sacrifices necessary for the ritual of utopian construction. These puppets then employ various means to increase the dead and provide sacrifices. Some, for example, become leaders of the Shogunate to carry out ruthless policies, some became common murderers, and still others deliberately incite revolt against the government. Through the influence of the devilish reincarnation, outbreaks of famine and plagues further increase the dead, providing the evil with yet more strength and delight. The mountain of dead gathered by these means is subsequently heaped up on the altar of the Netherworld and fashioned into two pillars in which the hermaphroditic male and female are to be subsequently imprisoned. At this time one man returns to the Netherworld. The name of this warrior who stands directly before these literal pillars of the dead in the darkness is Asura. Master of magic, he is the dark swordsman appearing in this realm to wreak his revenge on Yuga. Regardless, his enemy steadily proceeds with the construction of his utopia.The curtain now rises on this drama of revenge that will engulf both our world and the land of the dead. 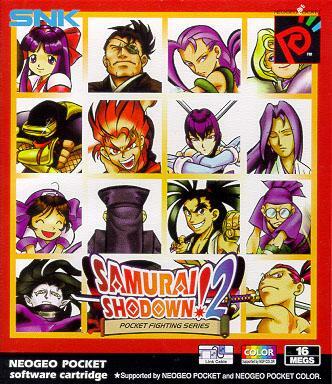 REVIEW: The sequel to the first Samurai Shodown game for the Neo Geo Pocket, Samurai Shodown 2! 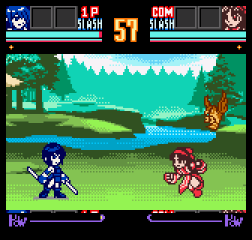 Pocket is an interesting handheld spin-off of SNK's famed samurai fighting game franchise. 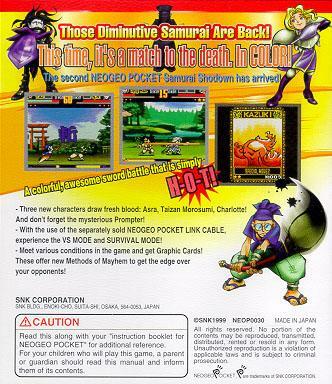 SS2Pocket brings back most of the original cast and even introduces a handful of characters from SNK's obscure Neo Geo 64 title, Samurai Shodown 64: Warriors Rage. The graphics style is very similar to the first game but is obviously now in color! Wooo! Looks a little too peaceful doesn't it? 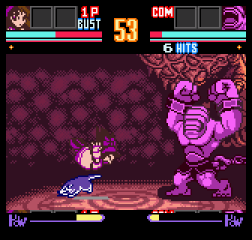 The gameplay is pretty straight forward and considerably solid for a handheld fighter, but it is a level or two slower than some of the other fighting games on the Neo Geo Pocket. The character roster has improved from the first game and characters have an impresive amount of special & super moves. 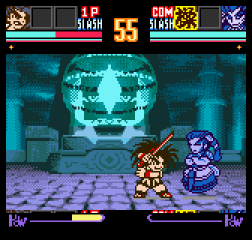 The graphics (and gameplay) fall just a bit short when compared to Last Blade Pocket, and that may be because this game came out a year before it. 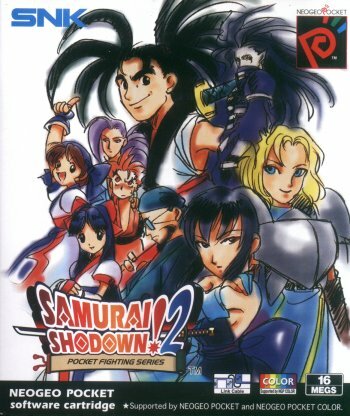 Although it earns it's cool points here and there, the "pocket" series of the Samurai Shodown franchise doesn't quite capture the mood or the awe-factor that the original Neo Geo games did.